Toenail fungus is an extremely embarrassing infectious disease. Nobody wants to suffer the anxiety of infecting friends or family. We understand how nervous you feel about revealing your infected and unsightly toes. you no longer need to! 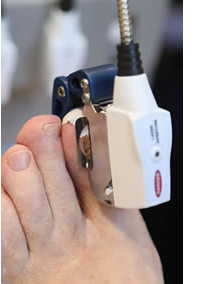 Thousands of patients have already benefited from NOVEON Nailasering. To prevent the infection from developing into something more serious and unsightly, it must be identified and treated as soon as it is suspected. What are the benefits of the NOVEON® Nailaser™ Treatment for toenail fungus? This is a proven and effective treatment with a 95% success rate for patients and an 87% reduction in severely infected toes. Download our information guide from this link or to find out more information on the Noveon NaiLaser visit this link. Contact us today to make an appointment or if you require any further information.